So the following is a brief tutorial on how to go about creating your first semi-interesting application with Python & QT. We are going to create a little application that will take input from the user, add said input to a list box and also allow the user to clear the contents of the list box. So if you have everything, we can go ahead and get started. Launch QT designer. In RedHat 9 and Fedora Core 1, it lives under Programming/More Programming menu. QT Designer will come up. It looks like this. 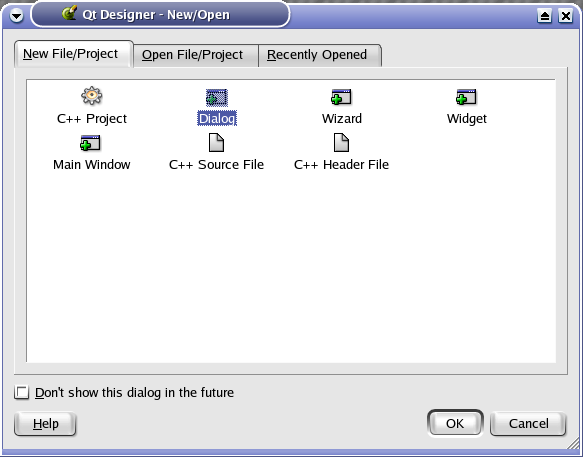 In the New/Open dialog box, click on Dialog, and hit OK.
QT Designer will create a new dialog canvas for you and call it Form1. 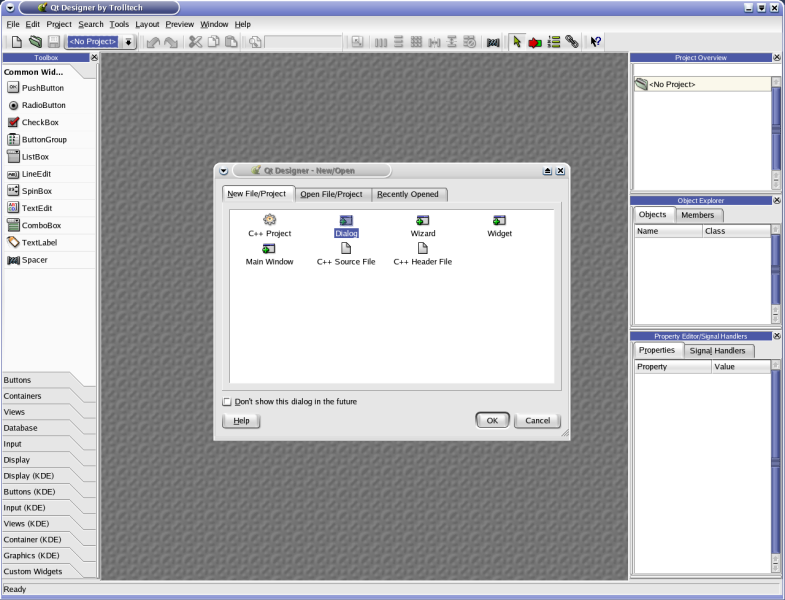 In the toolbar on the left select the LineEdit tool and create an edit box on the canvas. 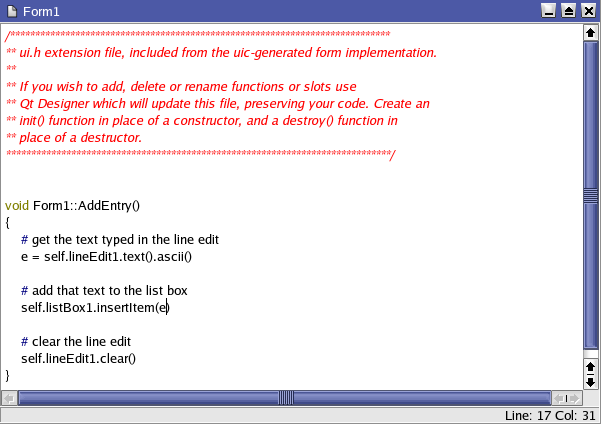 Its name will be lineEdit1. This is how we will take input from the user. 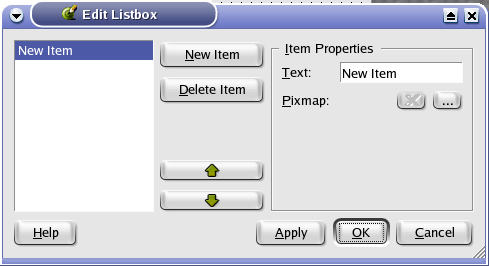 Now, select the ListBox tool in the toolbar on the left and create a list box on the canvas. Its name will be listBox1. 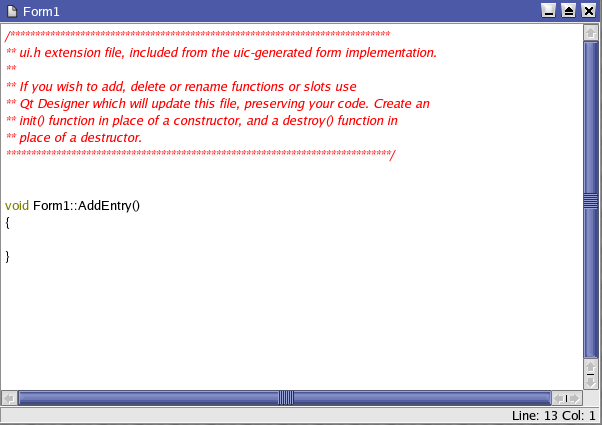 This is where we will store the input that the user typed in. Notice that there is already an item in the box. We don't need it. Let's get rid of it. Double-click on your list box on the canvas. 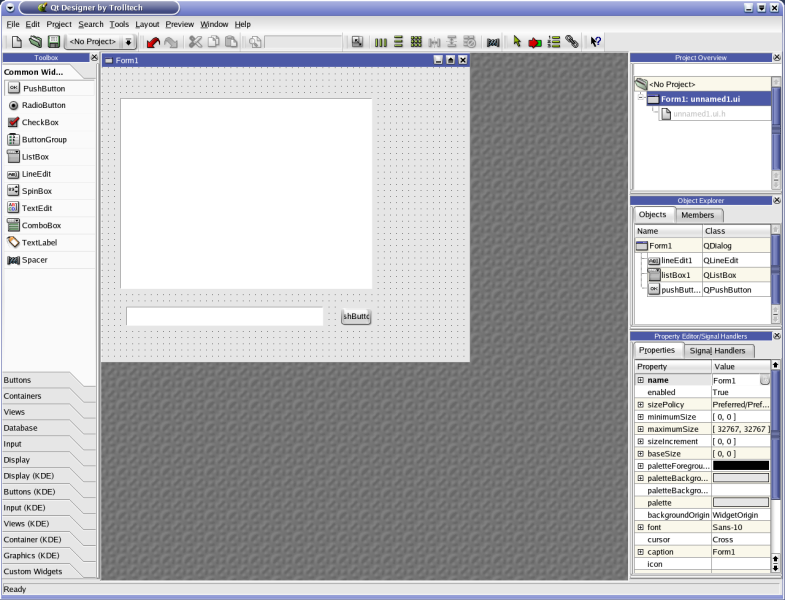 A dialog will pop up showing the contents of the list box. Hit Delete Item to get rid of the item. Then click OK.
Now, select the PushButtontool in the toolbar on the left and create a button on the canvas. Its name will be pushButton1. Double-click on the button on the canvas. 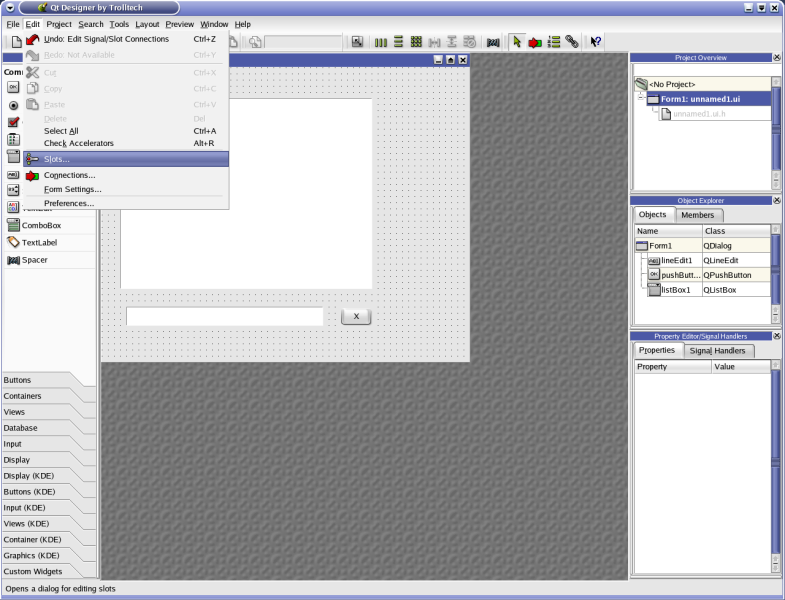 A dialog will come up where you can change the text displayed on the button. Let's rename it to X. Then click OK. In the previous step, we used a built-in slot to accomplish something. Now, let's create our own slot, which will take input from the edit box and add it to the list box when the user presses enter after typing something. To create a new slot (remember, it's just a method), select Slots from the Edit menu. Now that we have a slot, we can connect something to it. 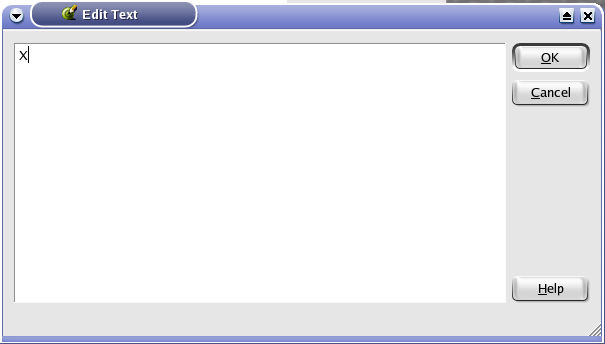 Recall that we want to add an item to the list when the user types something in the edit box and presses Enter. 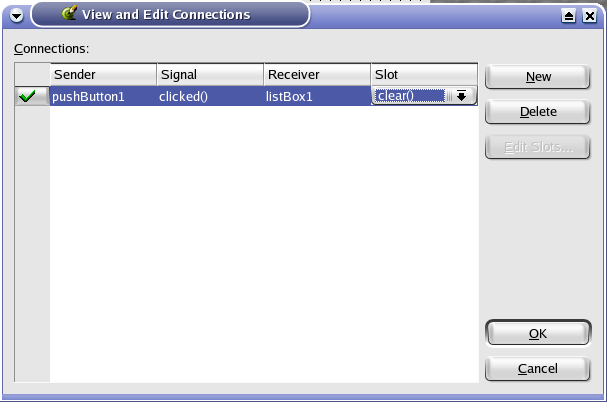 Select our good friend the connect tool and now connect the line edit to the list box. The connection dialog will pop up again. 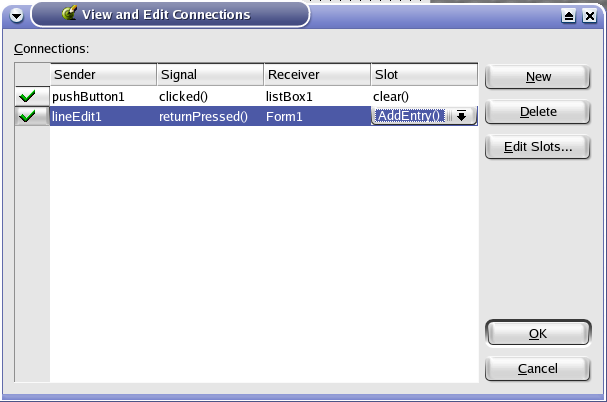 This time select lineEdit1 as the sender, returnPressed() as the signal, Form1 as the receiver, and our own AddEntry() as the slot. Almost done! Last thing we need to do is to turn off the autoDefault setting for our delete button. 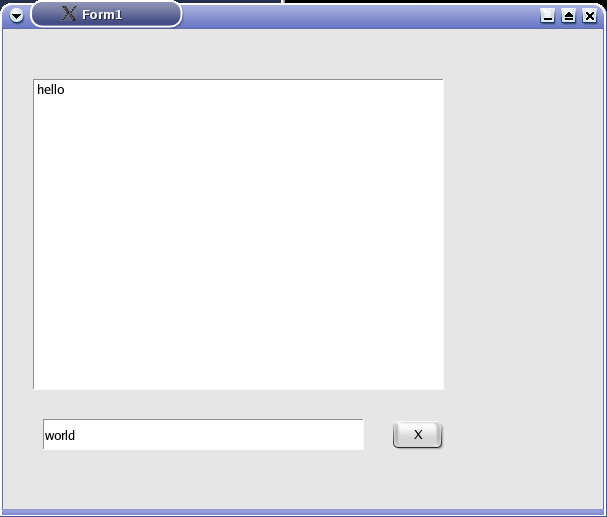 (Setting a button as default means that it will get 'clicked' if the user presses Enter on the dialog. For us it would not make sense to add text to the list box on Enter, and then have the delete button automatically triggered, clearing our list box.) 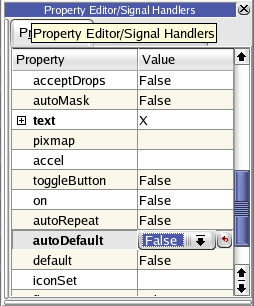 The autoDefault property is True by default, so we need to set it to False in the Property Editor window for the button. Click on the button to see the Property window for it in the lower right-hand corner. 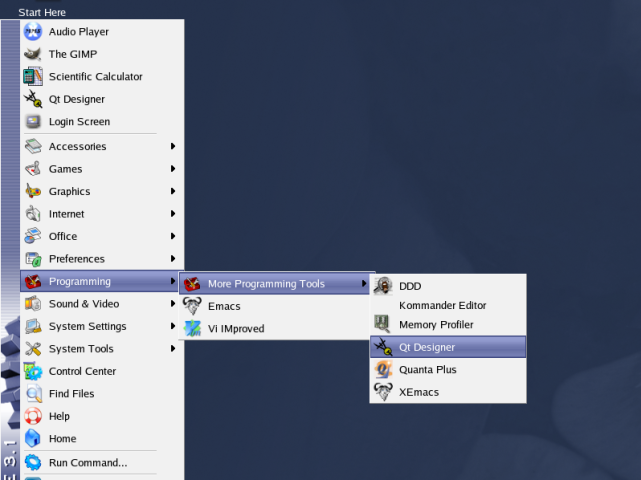 Finally we are done with QT designer. Save all your work. Well, that's about it. Now go create something more fun! Except you probably want to know about all these widgets and all their methods. How do we know who does what? 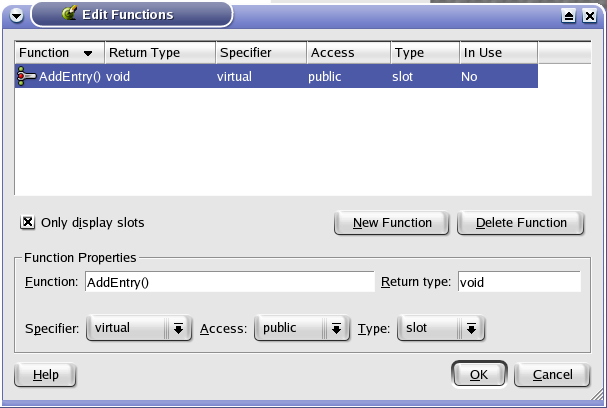 The easiest way to find out is to read the QT Classes Reference (or the Main QT Reference page) that describes all the QT classes (including all the widgets) and their methods and properties. Their examples are in C++, but they translate very well into Python. All the names are exactly the same -- just replace C++ syntax with Python, and you are good to go! As an exercise, add some Python code that saves the contents of the list box to a file on exit, and then loads the data from the file at startup. Good luck, have fun, and I hope my tutorial has helped you out somewhat.